I was recently asked why I keep publishing OLPC News. After 3 years, 1,260 posts and 13,640 comments on OLPC News, and 3,500 topics and 29,400 replies on OLPC News Forum, what continues to drive me? Why do I spend untold hours of my life writing new articles, coordinating Guest Posts (write yours today! ), and shepherding along the Community Forum. Please do not think its for the money - my wife would die of laughter. I still make sure we have quality content and new forum topics 5 days a week, because I am still driven by my original 3 beliefs around One Laptop Per Child. Its true. Even with 678 blog posts of my own, I have not had the impact on OLPC that I hoped when I started this endeavor in August 2006. OLPC is not what it should have been, had I connected better with its leadership and helped it realize how arrogant and naïve its ideals were at the beginning. I did not convince them of the real need for small-scale pilots early enough. I did not foresee the debacle that the first G1G1 became when the OLPC shipment process imploded. 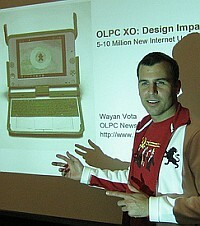 I wasn't able to keep OLPC from looking the fool in its Intel odyssey. And somehow, Nicholas Negroponte still continues to flirt with Microsoft. So it seems that none of my suggestions, ideas, and outright jack-slapping has had much effect on OLPC, the organization. It's a train wreck in slow motion that has an air of decline, no matter the flashy XO-2 press releases. Let's look first at the 4P Computing revolution that has cheap netbooks now commanding 20% of the global computer market. From the Classmate PC, to Asus Eee PC, to my favorite, HP Mini Note, the XO laptop is basking it the ultimate form of flattery: imitation. And the reason why? G1G1 2007. By stunning the world with 100,000 XO laptop orders in six weeks, we jump started the 4PC category with our display of deep netbook demand. I would like to think OLPC News helped stoke the demand and OLPC News Forum sure helped us figure out the G1G1 delivery disaster. More than just laptops, the whole conversation around technology and education has changed. Before OLPC, mentioning computers in classrooms would bring forth memories of Apple's Classroom of Tomorrow, which ended back in the late 90's (and still doesn't have a Wikipedia entry!). OLPC started to change that with a refreshingly new take on computers in schools. But OLPC was just Nicholas Negroponte and Walter Bender. It was your excitement, your enthusiasm, and the global groundswell of good will towards a education + laptop + Linux + NGO initiative that created a one laptop per child movement. It's this idea that is now on the minds and in the budgets of countries around the world. I would like think that our 700+ Guest Posts from the likes of Mark Warschauer and Martin Woodhouse had something to do with that change. While the future of OLPC as an organization can be debated, we can all agree that the future of education has technology as a core component. And now we can also be assured that one aspect of that edu-tech future will be a computing device in the hands of each child in every classroom, and this future will happen years sooner thanks to One Laptop Per Child. I only dream that all my efforts with OLPC News has helped in some infinitesimally small way. Which is why I am still here, your faithful publisher of OLPC News, three years later and hopefully at least three years into the future. I have met people recently that had never heard of OLPC News or its Forum, yet had an XO. Too bad that OLPC never told its customers about those websites. I would have long ago stored my XO or sold it via Ebay out of no use! Why can't today OLPC tell the remaining XO users about these websites? I had "predicted" in November '08 that the XO would be superseded by some competitor machine by March '09, and OLPC as an organization would implode by May '09. I am glad (and surprised) to be wrong on both counts. The XO-1 is still an amazing piece of architecture, well worthy of not being messed up by silly feature creep, and nobody seems to be able to fully match it, by now mostly because of the non-compete regarding the screen. 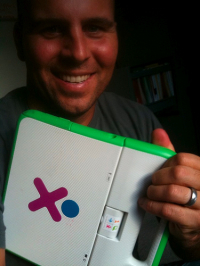 As to OLPC, hey, I admire and feel deep kinship for something that keeps moving. Even when by all reason it's not yet anywhere close to where it should / could be if, I still hope that those who "won" as you well say, and especially the volunteer community, had a hand and a voice in getting us there. you are doing a good job in all fronts, including #3. Yes, nobody from OLPC or NN himself came out to say "you are right", but changes do happen. The extend of OLPCnews contribution in this can not be quantified but can not be dismissed either. You certainly stepped on several toes, some times right, some times wrong but issues where raised either way and some people got thinking about them. However, unless a new successful G1G1 comes about or XO-1.5 goes retail, I think you may want to distance a bit more from the OLPC organization and its hardware, and maybe focus a bit more on the OLPC idea. Sugar and SugarLabs (rarely appearing on these pages), pilots, deployments, other relevant initiatives, might be the way to go. Some effort must be made also to overcome the language barrier. Most of the OLPC staff is happening in non-english speaking countries. Finding an easy, for them, way to have input (eg editing google translations of published or new articles) may provide some fresh views and ideas from people with first hand experience. I understand that some editors are fluent is Spanish for example, they should be able to help in this direction. In any case, keep up the good job. 2. You should see more about deployments new and in the future, as there is more press coming out about them. Wayan, do you realize that your dream of technology enhancing the education of children all over the world is best achieved by not tying it to any specific device? Making educational content available online is the future. Negroponte, on the other hand, only wanted to sell his laptop - he said it to Ivan Krstic. The goal for Negroponte/OLPC was never education. Krstic put it in writing for all the world to see it. I am so humbled by your comment. Thanks! You just made my week. I really enjoyed this post. Thanks for adding a unique narrative to the ongoing debate over technology. You have to have these injections of crazy ideas or else the status quo will be maintained. It's about pushing the edges and taking risks from time-to-time. Not just in this aid space, but in business as well. Bravo, Wayan . . .
OLPC should hire you to get their program in high gear again. Then again, we wouldn't have you run the excellent OLPC News blog and forum. Yes, it's the same for me. There are some things I can talk to Nicholas about, but he doesn't get some of the most important points. So we have to go around him, as we do at Sugar Labs and Earth Treasury. But give Nicholas credit. Nobody else would even try to do what he has done. Many of us also tried, and precisely that is why we cannot dismiss him - he has succeeded where we didn't. While IMHO we are still far from getting this to work the way it should, the fact is that so far this is happening. Then, maybe if he had dared give a place to the community, this would have been so wildly successful it wouldn't be Obama making the news today, but then, of maybes and ifs there's too many to count. OLPC news has provided a much needed service to the OLPC ecosystem. Without OLPC news we'd have no idea what was going on with future models, articles written from the field (showing successes and otherwise of OLPC). As it seems little, if any, information actually trickles out of OLPC. I'm surprised that they don't take advantage of your readership to build support within the community. I think we became 'OLPC aware' around the same time. Your enthusiasm and seemingly blind devotion to the cause is what made it stick, for me, your insight from the various perspectives (sarcasm, suggestions, sympathy, criticism, movement) and the collective responses from readers, made it a clear case. It became alive like colors in a picture. Regarding #3, thats certainly true from a certain perspective, OLPC maintains their set course. They do that without becoming distracted from reaching that goal. That does leave opportunities out (or behind), and I guess is not something you (or we) could have changed in 3 years, unless you got hired as a VP or something. Educate the world. As Edward, many people have become aware of the fact that laptops, for the coming years at least, are pretty good means to harvest, interpreter that and create new, sometimes more valuable, information. Education has been all about the books, about demand from business, you learn, we teach, you work. And indeed with Apples and other commercial product's, schools and governments have not be able to afford this type of schooling system, so far. I think that a slight change in direction; educate the educators and enable them, will have a humongous impact on worldwide education. An approach like OLPC, but with other devices and organizations. Today, a course of 'history' in Dutch education, when you are 12-18 years old, is often delivered in 3 'books' that include both text- and workbook, so when your done, them book's became useless. They cost about $40, each.. I believe that if a (Dutch) school spends 35% of their book-fund money on a hardware device, it'll have no significant impact on their total budget. 35% Less books leaves plenty of books to carry around, and offers a graduate introduction tot the device for involved parties. Now next year... you'll still be able to buy just 65% books (or less), but your hardware is still running, that's a 35% cost reduction right there. In a The Netherlands, that's a whole lot of money. Here's my thought. Laptops are quite durable (although my 1986 Talking Computron still works like a charm, lets say 5 to 6 years? ), so if we (the wealthy) use the laptop for 2 or 3 years, and then donate them to needing parties (as complete kits of infrastructure, all over the world), in Dutch primary education only, we could be shipping out 500k to 750k laptops a year. Directly from schools (as partners of the NGO) to schools. A pleasant sidekick is that we (EU) currently spend lot's of e's on development-works, how much of that goes to educating the third world, and could be used for developing new, more effective/durable, solutions? As an early guest contributor, I was as eager as you to push the educational part of the project. 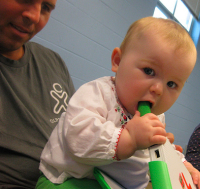 Unlike you, however, I became disillusioned early on about the effort from OLPC in this regard. I commend you and congratulate you with the persistence that guided you to keep pushing for this effort. As someone who truly believes that education is the key for solving many of our current crisis, you have done a spectacular job in pushing this tech project into engaging more in education. I was composing a letter for you, for the first time, but I think I accidentally hit the enter button and the whole thing was lost because a new window opened on my netbook screen. I thank you for the effort that you have invested in OLPC News. Since discovering the XO laptop in a World Bank blog written by Michael Trucano about the CEIBAL Project of Uruguay, I have been totally convinced of the value of the XO and for that matter of laptops for use in educating kids and even us adults. I even emailed Mr. Nicolas Negroponte some four months past. He did not reply. I understand, He does not reply to emails. He has done more than enough by the effort to revolutionize education and the way we use laptops to educate kids. I salute and thank him for that. I am writing to connect with you so that we can get XOs. My wife is a dedicated teacher who help out-of-school youths and children get a basic education. I am a volunteer teacher and driver. We use a motor bike to reach villages in the mountains and coastal areas far from the town center. Hence, we pioneered the use of laptops as a tool to educate these most deprived sector of our population. We work in the Municipality of San Fernando, Province of Camarines Sur, PHILIPPINES. Purchasing XOs is a lot cheaper than buying brand new laptops, plus they are powerpacked with features and learning software. We do hope some day a rich guy or girl may give us a donation of his/her old XO that still works. Can you help us where we can buy at least five (5) XOs, or maybe just hoping that through OLPC News, somebody will get to know us and donate an XO for our out-of-school learners. Our muncipal census lists a total of 1,438 kids (25% of children aged 6-12 yrs old) who are not in school (elementary level) and 1,301 youths (47.47% of teeners aged 13-16 yrs) who are not enrolled in high school. And for their use, we only have five units of lap tops!!! And I hope to get a reply. Just to let you know quickly that, as a main developer of the open-source e-learning system chamilo (and previously the same role in dokeos), olpcnews kept me from forgetting about the OLPC project overall. It kept me in touch and I am much grateful for that as I know we've had impact on education in poor areas of Uruguay and Peru thanks to that. I pretty much agree with you on your conclusions: we've really pushed (all together) the whole thing about technology in the classroom a lot further than it would have been and the impact of the whole OLPC community has been huge.